They had to wait a while longer than hoped, but made it happen yesterday. Broadhurst Park is officially opened, showing the power of fan ownership in football! It’s not any of the greatest stadiums by architecture or technology, but it managed to make headlines around the world in recent days, including the likes of China or Japan. The reason is purely social: Broadhurst Park was built by supporters and is co-owned by them. Of course fans building it isn’t literal, although many of them volunteered for some tasks and did fittings or furnishings. More importantly though, the project was initiated and mainly funded by FC United of Manchester, the “rebel” fan-owned club, whose numerous shareholders also contributed personally to raising the necessary funds. Initially planned to cost £4.5 million, the building later went up by a million and eventually is estimated to had cost £6.3 million. Largest contribution came from FC United, though several donations/grants were required in order to make the dream real. Construction began in Nov 2013 on the site of Moston football fields in north-eastern Manchester. The sports complex was established back in 1927 and enabled by Sir Broadhurst (he donated the land in 1920), whose name it now bears. 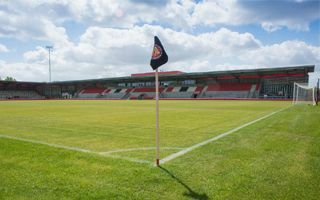 At the beginning Broadhurst Park was thought to take 40 weeks to deliver, but after issues with the playing field and subcontractors it wasn’t ready until May 2015. First test game took place on May 16 and positive evaluation made it possible to host Portuguese giants Benfica on May 29. That day was the 47th anniversary of the 1968 European Cup final, which also saw Manchester United face Benfica. The building was erected along the east-west axis with main grandstand being built in the south. Conjoined by roof with the significant eastern terrace these two sections may easily be connected by a corner section, left for further development. West and north sides are occupied by modest “sheds”, which allows people to stand behind the field protected from rain. These sections too are possible to expand. Aside from FC United of Manchester, who recently won their first ever promotion to the 6th league (having begun from 10th tier in 2005), the stadium also hosts Moston Juniors, a local football team.